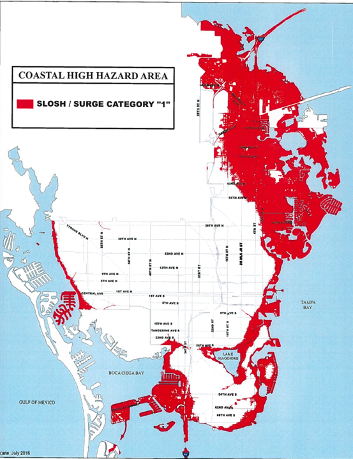 City Council is currently split in its decision whether to pass an Amendment to St. Pete’s Comprehensive Plan, which would keep open the door for potential residential development in the City’s Coastal High Hazard (“CHHA”), those areas in St. Pete more vulnerable to storm surge during a hurricane. If City Council fails to pass this Amendment, developers will be permanently prohibited from constructing residential properties throughout the entire CHHA. The Amendment would eliminate this permanent restriction and instead allow the City to consider requests for future residential development in the CHHA by balancing certain criteria to ensure the proposed development is smart, safe, and mitigates public safety concerns associated with storm flooding. For example, under the Amendment as written, a developer requesting to construct residential property in the CHHA must also propose a flood mitigation strategy such as providing additional money or contribution of land to the City to construct new hurricane shelters specifically for residents within the CHHA. Opponents of the Amendment believe that no mitigation techniques can alleviate the risk of flooding in the CHHA during a hurricane. However, these opponents disregard the most important element of the Amendment itself: the City will always have the absolute discretion to deny any future request to develop within the CHHA if public safety concerns outweigh the benefit of the residential development. Importantly, the Amendment simply opens the door to the possibility of future residential development in the CHHA, rather than permanently prohibiting it. The possibility of future residential development is significant because the CHHA either encompasses or is adjacent to areas in St. Pete that continue to flourish but remain too expensive for most St. Pete residents to actually live in. Approval of this Amendment could allow reasonably-priced residential developments to be available near or in the most expensive areas of downtown St. Pete, the Innovation District, and Carillon Park. The City Council is holding its next meeting to discuss the Amendment—including ways to potentially narrow its scope—on October 18, 2018. If you are potentially a property owner within the CHHA contact the attorneys at Englander Fischer to ensure your rights are heard by City Council.